Ever wanted to explore the fun and fascinating world of cartooning? Now’s your chance! Join acclaimed Disney animator Preston Blair as he shares his vast practical knowledge of cartoon animation, explaining and demonstrating how to create an original character—from the character’s basic body shape to its personality, features, and even its mannerisms. Blair covers all the basic concepts, including squash and stretch, line of action, and character types, then provides an introduction to animation with some simple action cycles. With easy-to-understand instructions, insider’s tips, and inspiring drawings, this is a kit no cartooning enthusiast should be without! 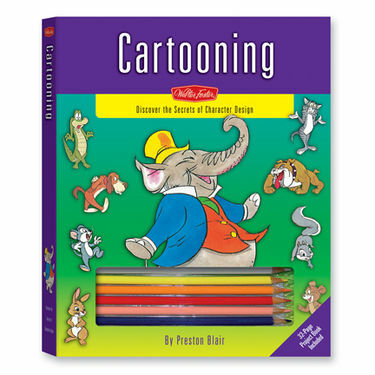 Hardcover 9" x 11.25" case includes 32-page paperback book, 2 drawing pencils, cartooning pen, eraser, tracing paper, flipbook, 8 brush-tip markers, 8 colored pencils, sharpener, drawing pad, and blank “draw your own” cartoons book.